Moshe Ben-Shaul (1930-2007), born in Jerusalem, was a seventh generation native Israeli. He fought in the 1948 War of Independence and began to publish poetry in the early 1950s, as a member of the Likrat literary group. At the end of 1956, he moved to France to study painting and theater history, and later settled in Tel Aviv. 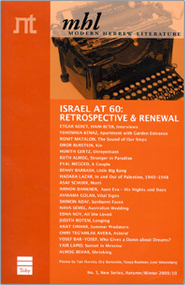 Ben-Shaul edited various journals for young adults, and was member of the Maariv daily newspaper editorial board. He was twice the editor of the monthly cultural magazine, Moznaim, as well as one of the editors of the literary magazine Revi'iya Chad-Pa'amit. Ben-Shaul served as Israel's cultural attaché in Paris from 1987 to 1991, and translated works by Daudet, Apollinaire, Cocteau and Rimbaud into Hebrew. Best known for his poetry, he also published fiction, wrote and illustrated children's books and designed scenery and costumes for the theater. Ben-Shaul received several awards, including the Lamdan Prize for Children's Literature (1965), the Yatziv Prize for Children's Literature (1975), the Miriam Talpir Prize for Poetry (1975), the Bernstein Prize for Children's Literature (1980), the ACUM Prize twice (1985; 1995), the Ze'ev Prize for Lifetime Achievement (1993) and the Prime Minister's Prize twice (1995; 2000). His poems have been published in 13 languages.